Marvel's The Thanos Imperative is a scorcher. Drawing allot of well-deserved attention to both the cosmic characters involved, as well as the mad writing skills of duo Dan Abnett and Andy Lanning. One of the books brightest and biggest stars is the young 20-something hero Nova. 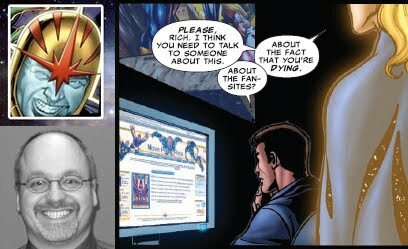 Never one to miss an opportunity, I grabbed the chance to interview ultimate Nova-fan Doug Smith, on what the book means for him and also his website; The Nova Prime Page - the definitive read for fans of the character since 1999. IADW: Nova may be 'The Human Rocket', but it's taken years for his current 'overnight success' to lift-off. 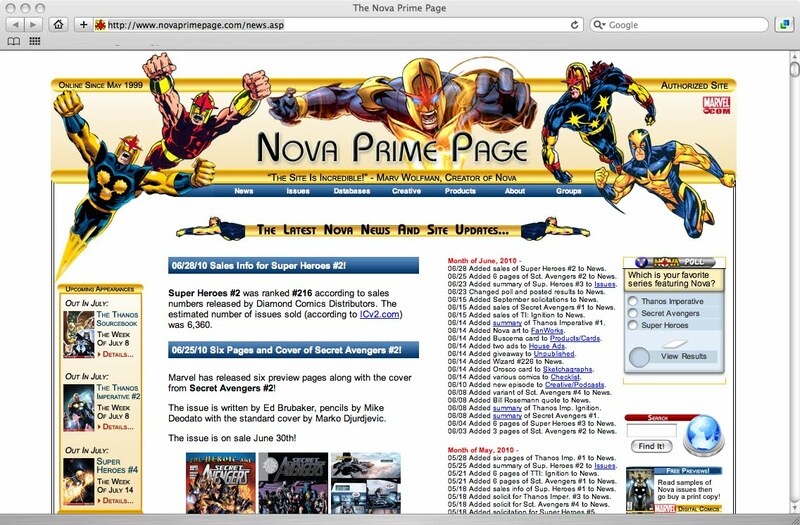 What made Nova your passion, to the point where you produced The Nova Prime Page? Doug: I’ve been a huge Nova fan since The Man Called Nova #1. Funny thing is; I almost didn’t pick it up because the cover of TMCN #1 had one element that scared the bejeezus out of me – the helmet! There was a Brian De Palma movie called Phantom of the Paradise that I saw on HBO in 1976 when I was 12 and it gave me the heebs. The main character wore a helmet that, to me, was similar to the one I saw on Nova. Thankfully, the cover was so well designed and fantastic that I decided to look through it. Once I started reading it in the grocery store, I was hooked. I could relate to Richard Rider like no other comic book character before or since. Plus he had the most awesome costume ever seen! The Nova Prime Page was started just over 11 years ago during Erik Larsen’s Nova series. I had finished doing another website on the US/Soviet Union’s race to the Moon (another huge passion of mine) and wanted to do a comic book site. It came down to either Superman, the Invaders or Nova. 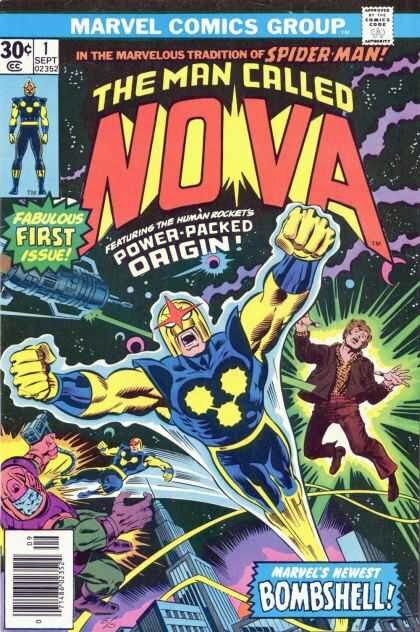 I picked Nova because he was a big favorite of mine, he had a new series and there were only two Nova sites on the internet at the time. IADW: The Nova Prime Page does a great job of keeping track of a guy that moves at amazing speed. It has pro-sketches and even a quote from Nova creator Marv Wolfman, that the site is "incredible". How does it feel to have that kind of recognition? Doug: When I got in touch with Marv for the first time on e-mail about the site, I was seriously nervous. Which is odd because I had met Marv in person before at Chicago Comicon back in 1986 and handled that without getting a case of fan-freeze. I think it’s because I was so worried how he would feel about my doing a site on one of his favorite creations. But Marv is an extremely kind and generous person. To have his seal of approval meant the world to me. Two other recognitions of the site still have me flabbergasted. Artist Brian Denham wanted to thank me for the work I had done on the Nova site and had me send him a picture of myself so he could draw me into Nova #7 as a Centurion. Later, the Nova creative team made The Nova Prime Page a small part of Nova #23 when the site appears on Robert Rider’s computer for a couple of panels. To say I freaked out about those incidents seriously undermines the term ‘freaked out’! I’m sure it looked like I was either having a seizure or had been hit by lightning. But seriously, I can’t thank them enough for their generosity and kindness. IADW: Marvel's given Rich four ongoing series, not to mention key roles in all three runs of the New Warriors. This kind of ongoing faith and exposure is usually saved for the iconic likes of The Silver Surfer, Punisher and Ghost Rider. What is it about Rich that you felt has kept Marvel dusting him off and seeing how he flies? Doug: In some ways, I think it goes all the way back to Marv’s original series. Even though it was only 25 issues, I think it made a huge impact on those of us who read it. And those fans included the people who would later become comic book creators. They remembered the character and wanted to do their own stories of him. And that in turn continues to inspire more creators. Some of the new writers and editors in the industry will remember Nova from his days in the New Warriors and may want to do stories about Nova. Just as creators in the near future will have been fans of Nova’s series by Dan Abnett and Andy Lanning. 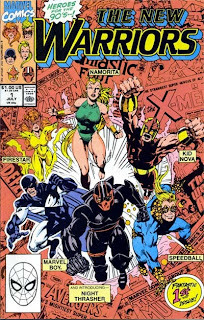 The beauty of that is with each new generation of writers, Nova as a character has developed and evolved. Richard Rider has grown up during our lifetimes but the essential core of the character (his values, his personality, his ‘every guy’ appeal, etc.) has remained constant. That can’t be said for very many comic book characters in general. Plus he has science fiction roots that are pretty unique in the Marvel universe. He can have great stories based on Earth as well as anywhere else in the universe. IADW: It was in the pages of Fabian's New Warriors I first ran into the Human Rocket. Nova's journey of getting out of the depression that came with the loss of his powers, their return, and finding his worth - powers aside - was just fantastic stuff. Now Rich has matured even further, do you feel the old warriors gang could ever relaunch? Would you want them to? Doug: I’d love to see a New Warriors reunion with the original group. However, I’d only like to see it as an annual or maybe a mini-series at most. All of them have changed and matured so much that an ongoing title might eventually feel forced and done only for nostalgia’s sake. Sort of like when bands reunite after a number of years. It’s great at first but they seldom stay together doing new and interesting things. However, seeing them all interact together and then realizing how they’ve all changed would be fascinating. 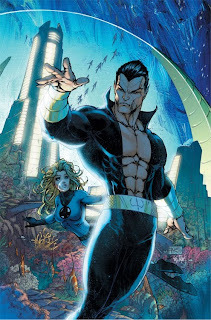 Especially if it were done from Namorita’s point-of-view given her current state. Since she was pulled from the timestream at a point when the group was originally together, she would have an interesting perspective on the team during their reunion. IADW: A big step in Nova's evolution was Annihilation, the event mini-series that kick-started his current run. Can you remember when you first saw or heard the teasers for Annihilation and realised Nova was back on the board? Doug: I remember hearing about Annihilation in an article on Newsarama. Along with the announcement came the beautiful cover art of Annihilation: Prologue. Just based on the fact that Annihilation was being written by Keith Giffen and the Nova mini by DnA along with that cover, I knew Nova was in for something big! And, boy, was that right on the head! IADW: From having Nova try to evacuate a planet in the few hours remaining before Galactus devourers it, to the mental, often humourous conversations between Rich and Worldmind, one of the best parts about the current Nova monthly is you just never know where writers Dan Abnett and Andy Lanning are going to take you next. What have been a couple of your favourite moments that made you feel 'yeah that's classic Nova right there'? Doug: The Galactus story arc is one of my absolute favorites from the DnA series! I have never seen Galactus portrayed with more cosmic majestic force than in that story. And to see Rich committed to saving as many lives as he could despite the risk spoke so true to the character’s values. Some of my other favorite moments are those that came during his visits to Earth. His interaction with Tony Stark in Nova #2, the creation of the new Nova Corps and the reveal of Ego with a moon-sized Nova starburst at the end of Nova #20 (that almost made me swallow my gum). I also loved it when Nova easily took out Diamondhead in Nova #2! That so eloquently showed how much more powerful Nova is now. IADW: Evil opposites of classic heroes are currently spilling out of The Thanos Imperative's cancerverse like ants at a picnic. Using the scene for wish fulfilment, who is the one hero you have always wanted to see Rich test his mettle against? Doug: Wow, that’s a good question….. I wouldn’t mind seeing Nova go up against the Sub-Mariner again. Rich didn’t do very well when they went at it in New Warriors #57 so a rematch at his current power levels would be great. 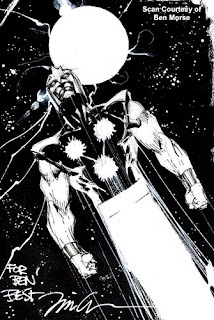 IADW: Sales pitch time; when the Nova monthly returns from hiatus post Thanos Imperative why should readers fork out a few bucks to give him a try? Doug: Nova is such a great character to follow especially in a space/sci-fi setting. As Abnett and Lanning have said before, Rich Rider is the Luke Skywalker of the Marvel Universe. He is an average guy with fantastic powers who finds himself facing overwhelming cosmic threats but will never give up in a fight especially when lives are at stake. Plus, Nova is a hero for the simple reason that he feels it is his duty to help others with his powers because it’s the right thing to do. And who wouldn’t want to read a character like that? Thanks again goes to Doug Smith for giving of his time in doing this interview! It's always great to talk with people who are passionate about comics - let alone one that shares a love of a character you think is pretty crash-hot. While Nova's monthly is currently on hiatus while The Thanos Imperative rages, you can also catch the Human Rocket in the pages of Marvel's Secret Avengers - both books are so good they should be given to folks at birth, so they don't miss out! While you are at it, just remember for all things Nova past, present or future, be sure to check out The Nova Prime Page! Nice interview! Really interesting, even for someone like me who's not a Nova fan. I'm with rob! on this one. Great questions with even better answers. Great work. Thanks for the great comments guys! I'd wanted to interview Doug since back when I did the DC 75 Fansite interviews. He was really great to talk to, and I'm glad the final product shows that!